Ben Berg has been working closely with Special Olympics since 2010 at Fox Valley Special Recreation Association (FVSRA). He also was an athletics coach for the Illinois delegation at the 2014 Special Olympics USA Games in New Jersey. Now he is continuing his dedication to Special Olympics in Spain, while he is there teaching English. Below are questions and answers regarding his current journey in Spain. Q. When did you get to Spain? A. I arrived in Spain in February and am only here until May. I am doing a 3 month homestay program which means I live with a host family and teach them English and in return they provide me with room and board. I also have some private tutor lessons that I get paid for. Q. What made you decide to go teach in Spain? A. A friend of mine did this same program and recommended it. I was interested in the idea of traveling so I applied just to see what would happen and within 24 hours I had a host family already lined up to stay with. Q. What did you do at Fox Valley SRA? A. I started at FVSRA in 2010 as a part-time staff for about a year and a half. I was hired on full time as the Athletics Coordinator which is how I became involved with Special Olympics. I was in that position for almost 2 years before becoming the Operations Manager, which is the position I held when I left for Spain. Q. Are you teaching English or something else too? In a school? What ages? A. I teach English to the host family at their home, however I have also been able to pick up some extra private tutoring sessions. The people I teach in these lessons range for elementary school kids to business professionals. Q. What do you plan to do when you return to the states? A. I’m still trying to figure that out. Ha! The plan is to find a job (when I left for the homestay program I resigned from FVSRA) but as of right now I don’t know what that job will be. Q. What is the biggest challenge you’ve had teaching the students English? A. There is a lot of diversity among the students I teach in terms of age, current level of English speaking and comprehension, and motivations for learning English. Because of this I can’t just plan one lesson and implement it to everybody I tutor. Each lesson is different so I have to do a lot more planning and adapting depending on who it is that I am tutoring. For example, as I mentioned earlier, some of my students are children who are learning English in their school so I just help them with their homework. Others are business people and need to learn English for professional reasons so in those classes we work on reading/writing sample office emails or memos or translating their resumes into English. Lastly, some I tutor just want to increase their English so they can travel more easily. With these students we practice scenarios where they have to order food from a restaurant or make a hotel reservation over the phone; things that they will need to know how to do when they travel. Q. What’s your greatest accomplishment with the students? Has any student had a particular effect on you? A. Because this is such a short term teaching opportunity I haven’t had a lot of time to really see the fruits of my labor. None of my students have made really significant improvements in their English, but they all seem to enjoy the learning process. I think my greatest accomplishment is when I can plan an activity for a particular lesson that has a direct application to the student’s personal/professional life. Q. 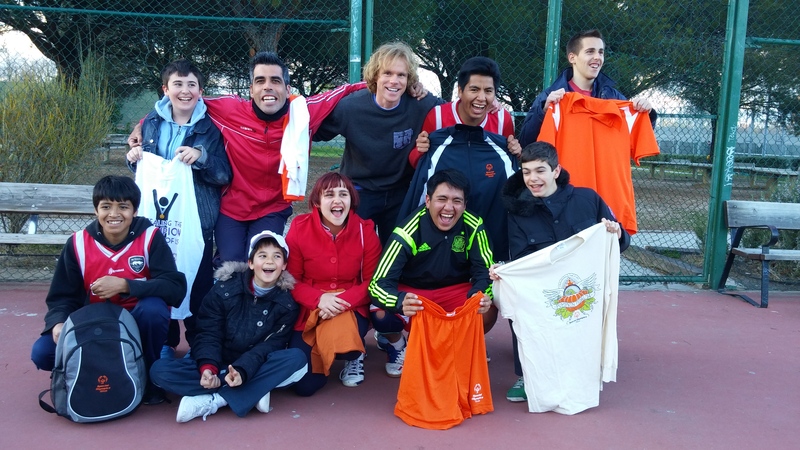 How did you get involved with volunteering with Special Olympics in Madrid? A. Because Special Olympics was a big part of what I did at FVSRA, I was curious to see how Special Olympics programs in other places/countries function. Q. Is volunteering for Special Olympics there different or the same? How so? A. Getting involved with Special Olympics in Spain was the first time I experienced Special Olympics from a volunteer perspective. At FVSRA my role with Special Olympics was different. I did more planning and coordinating. I was a contact person for the FVSRA families who were involved with Special Olympics. My experience with Special Olympics in Madrid has been different because here I just show up and lend a hand and try to help out however I can. The head coach, who also speaks English, does a great job in making me feel comfortable at practice and informing me of what the different exercises will be each practice and how he wants me to help. He also teaches me about how the Special Olympics program in Madrid functions and the structure of their competition seasons. The way he welcomes volunteers and makes them feel comfortable in the program is the same way I hope I welcomed new Special Olympics volunteers when I was in the leadership position at FVSRA. Special Olympics Madrid has a lot of differences to that of Special Olympics Illinois, but there are also a lot of similarities. The most significant difference, a part from the language, is the size of the program. In the entire country of Spain there are about 19,000 Special Olympics athletes. In Illinois alone there are 21,000. This difference is evident at the local level. I have been volunteering with a basketball program, and in the Madrid area there is only one team. In Illinois, basketball is a much more popular sport so it is common for one special recreation association to have several teams. Because there is only one team in Madrid, the team is very diverse in terms of age and ability level. Despite the differences there are also a lot of similarities. At its heart, I think Special Olympics is the same whether you’re in Illinois or Madrid. In my experiences with both programs, you see great coaches and volunteers who are enthusiastic and keep practices fun and entertaining while encouraging and challenging the athletes, you see families who are supportive of their children and the program, and lastly, you see the athletes demonstrate the same camaraderie with their teammates and coaches and display the same joy and excitement in accomplishing their goals. Q. How has your previous Special Olympics and coaching experience here in the U.S. helped you navigate your job over there? A. I think my previous Special Olympics experience has helped me with teaching English here in Spain. Through coaching Special Olympics, I have learned that it is important to identify an athlete’s ability level and know how to meet them at that level and build upon the skills and abilities they already possess. It is equally important to know how to accomplish this through means that are fun and engaging. In teaching English, I have taken a similar approach; identifying their current level of English and building upon that through games and activities that they enjoy.